German Eurosceptic MEP Hans-Olaf Henkel explains why he thinks Moscovici is France’s “Trojan horse” in the European Commission and why Chancellor Merkel is secretly pleased with the appointment. He also talks about EU-US free trade negotiations, saying that without transparency on what is being negotiated, it is impossible to have a legitimate opinion on the agreement. Hans-Olaf Henkel was deputy spokesman for the Alternative for Germany (AfD) party since March 2014. He is a member of the European Parliament and acts as deputy chairman in the Committee on Industry, Research and Energy. He spoke with EURACTIV Germany’s editor-in-chief Daniel Tost. Contrary to the will of party leader Bernd Lucke, a majority at an Alternative for Germany (AfD) party convention in March voted to oppose the Transatlantic Trade and Investment Partnership (TTIP) currently under negotiation. What is your opinion of TTIP? There seem to be varying positions in your party on this. Yes, there are. People are mainly worried about three points. First, the fact that everything is negotiated in secret and behind closed doors. Second, that certain German environmental, medical or consumer protection standards could be hollowed out. The third point is related to the intention of resorting to courts of arbitration when conflicts arise between companies and national governments. Of course these concerns are all legitimate. Although we are for free trade, we have said that we will reject a resolution at this time because we are not familiar with the agreement. That means the official position of the AfD is that we have no position on TTIP. That is the current situation. Beatrix von Storch called TTIP “unfair” for German companies. Do agree with this assessment? No. She is as unfamiliar with the agreement as I am. I am not for an agreement that I do not know. She should not be against an agreement she does not know. The outgoing European Commission recently decided not to accept the European Citizens Initiative against TTIP and CETA, the agreement between Canada and the EU. Is the Commission trying to keep the people and the parliaments out of negotiations? That could be. In that case, that would also be wrong. I believe we will only get the German population to accept a free trade agreement if we ensure transparency. That is why I am leaning towards more, rather than less, discussion over the content. But as I said – we do not even know what the content is. I see an irreconcilable contradiction between the claim that everything is secret and the claim that the result is completely unacceptable. If we have the result and consider it unacceptable, then it can hardly be secret. That is why I repeat that one should not be for the free trade agreement without being familiar with it. But one should also not be against it without being familiar with the content. This point is being completely underestimated by those in our party who have a relatively limited knowledge of economics. Apparently, the less familiar someone is with economics, the louder their criticism. We should get back to the core of our party. The core is euro policy. Euro policy is the reason why the eurozone has a long stretch of infirmity behind it and, unfortunately, ahead of it. Germany happens to be an export-reliant country where every fourth job depends on exports and on a well-functioning internal market. But when these slump because of the wrong euro policy, we should all be interested in correcting the situation. That can be achieved through an expanded internal market. We need more, a larger internal market for German medium-sized industry and jobs. And where can that be found? Not in Russia. Russia is an economic dwarf. It can only be found in other regions, such as the United States or Canada. Apparently Angela Merkel had hoped that Günther Oettinger would get the trade portfolio in the new European Commission, with which he would have become head negotiator for TTIP. Are you disappointed that the outcome was different? I hold Mr. Oettinger in high regard. I’d like to start by saying that. I think he did a good job as energy commissioner. And now I’m sure he will do a good job as commissioner of the Digital Agenda. Just because Mr. Oettinger is in the CDU doesn’t mean he’s a lemon. In the AfD, we should argue differently than our political competitors, who denigrate all AfD voters and members. Do you expect any improvement from the newly revealed Commission? We have to wait it out. Naturally it is a huge disappointment, almost a scandal, that Mr. Moscovici was appointed economic and financial services commissioner. That puts the fox in charge of the henhouse. In this way Mrs. Merkel has ensured that the French continue to have their own Trojan horse in the European Commission. To me, that is also not a disappointment from Merkel’s perspective. That is surely in her and Mr. Schäuble’s interest. The more the fiscal pact, which previously succeeded the Maastricht Treaty, is weakened, the less apparent it is that our interests are being stepped on again. Let me put it another way. The more the ECB prints money and the Commission continues to feed this process, the less often Mr. Schäuble must ask the Bundestag for new funds for crisis-ridden southern countries. In my view, it is completely obvious that they think it is good, despite their official protests, when the Commission, the ECB and the Troika turn a blind eye more often. In that case the likelihood is lower, that they must go before the German Bundestag to free up more money. The responsibility for Germany’s future debt extends beyond the Bundestag to the ECB and the European Commission. And that is politically desirable. Anything else would lead to further discussion within the Bundestag and that would only upset the German public. And Mrs. Merkel wants anything but that. Although the German government more or less declared it was against Moscovici? I think that was shadow-boxing. They do that quite often. Everything the federal government has let through since May 2010, it had previously rejected with abhorrence and indignation. Whether it was the first break with the Maastricht Treaty or the EFSF, which should have expired in the previous year and which was replaced by the ESM. Then the ESM was supposed to help states in financial crisis. Then it was decided, under pressure from France, that the mechanism should also be allowed to help banks. Then the European Banking Union was made a supervisory authority over European banks. In the meantime we have a collectivisation of risks associated with all savings deposits for all banks in Europe. In simple terms, that means German savers share the liability for Spanish and French banks. You can put the German government’s positions on euro policy in your pipe and smoke it. In general, and almost always, the French were able to assert themselves. And this time as well. What are the next big issues your party will address in the European Parliament? Well, first and foremost, that depends on what we are presented with. It will certainly be the vote over whether the Commissioners are qualified. Of course we will base this on the Commissioners’ hearings. But we have already reached a decision on one of them: We will most certainly reject the nomination of Mr. Moscovici. So he will not be able to convince you in the hearing? The French will make sure that the Germans vote for Mr. Moscovici – at least that is my prediction. 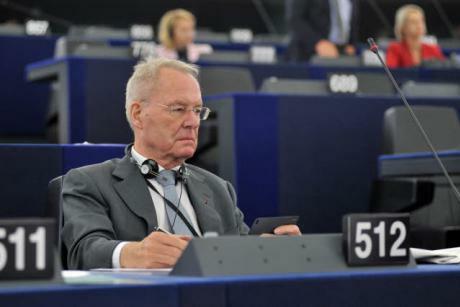 I am speaking for the AfD and probably also for our own political group, the European Conservatives and Reformists (ECR), who are now the the third-largest group in the Parliament. EURACTIV Gremany: Henkel: "Die AfD hat keinen Beschluss zu TTIP"
Mr. Henkel does not seem interested in protecting German interests. – The reason Germany is currently exporting so much is because the Euro is too weak for German industries (and too strong for southern industries). If Germany left the Euro, its new Mark would gain value vs the Euro, and destroy the German exporting industry. – The European Taxpayer is now also liable for German deposits. Considering that the German banking industry was important in causing the Financial crisis of 2008, mr. Henkel should also take appreciation of that fact. – A Strong Germany is essential for Europe. But the strenght of Germany will always be made with Europe, not against it. I must note i do agree with Mr. henkel on the TTIP. Also Germany, like any EU member state, has more than the EU’s single market / “Eurozone” as a destination for its produce, so do not bank on the possible loss of a chunk of the single market (due to exchange rates) as being damaging to Germany, being outside of the EZ could actually be very liberating to not just Germany, and indeed there are other countries that could well follow once the precedence for a Euro exit has been made. There is nothing wrong with this – for example, this is what happens with the wealthy state of Florida and the rest of the USA. Florida is subsidized by the massive Social security transfers to retirees that live in florida. Offcourse, the EZ is not a closed economy, but still germany exports to it ammount to about 50% of its exports. Any change to the status quo will tank that value – no way this is not damaging to the German Economy. Plus, why would Germany tank the Euro and its exports, AND get a bunch of neighbouring countries that would then be able to use currency manipulation to compete with itself? Abandoning the Euro is a lose-lose proposition. Strenghthening it is a Win-win proposition. I really cannot stand pathologic liars. So far, not a single Euro moved from Germany to any southern countries.